Ruisdael made thirteen etchings in all, but it is not know from whom he learned the technique. 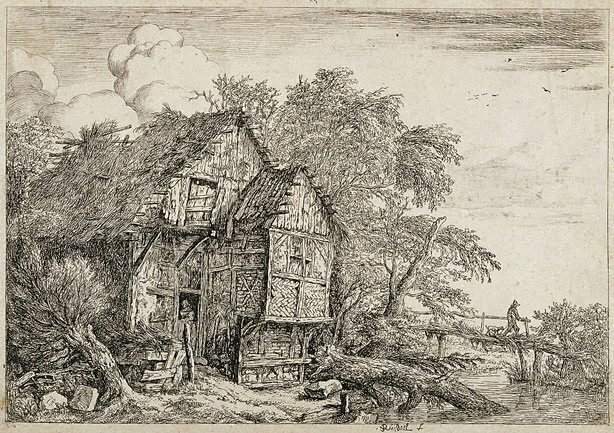 This robustly executed print, showing a tumbledown cottage nestled within a group of trees, was executed not long after Ruisdael returned from his journey to the border region between the United Provinces and Westphalia in Germany. There he would have seen half-timbered vernacular buildings as depicted here. He continued to incorporate them into his works for the remainder of his career. Signed l.centre, [incised plate] "Ruisdael ...". Not dated.